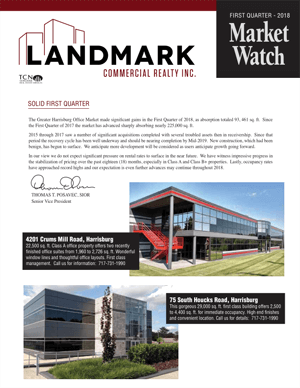 Landmark’s Senior Vice President, Thomas Posavec, SIOR has released the First Quarter 2018 Market Watch Report. The Greater Harrisburg Office Market made significant gains in the First Quarter of 2018, as absorption totaled 93,461 sq. ft. Since the First Quarter of 2017 the market has advanced sharply absorbing nearly 225,000 sq. ft.